Gilcrest is a beautiful setting for an intimate, private wedding. * If you are a couple looking to have a private, very small wedding give us a call. New Hampshire does not require any witnesses allowing a couple to escape and get married privately. Are you looking for a Justice of the Peace to marry you? 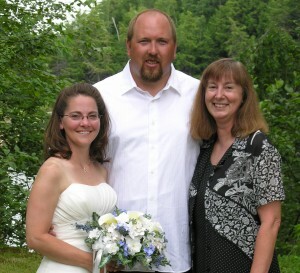 Julie, the owner of Gilcrest Cottages, is a J.P. and enjoys doing weddings. Contact Gilcrest Cottages for information: 603-726-3330, toll free at 1-888-741-0129, or by email to info@gilcrestcottages.com. * Sorry we are not able to accommodate larger weddings but are always here to accommodate guests of a wedding in the area.